On January 14, 2004, President George Bush announced "new course for America's space program" at NASA Headquarters, Washington, D. C. Image courtesy NASA. January 14, 2004 Washington, D. C. - At NASA's headquarters this afternoon, President George Bush was greeted by NASA Director Sean O'Keefe and Astronaut Mike Foale, who spoke from the International Space Station (ISS) orbiting Earth. 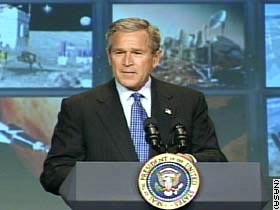 President Bush began, "Today we set a new course for America's space program. We will give NASA a new focus. We will build new ships to carry man forward into the universe to gain a new foothold on the moon and prepare for new journeys beyond Earth. ... We will expand human presence across our solar system." Previous PostPrevious Part 1 – Is Dark Matter the “Heavy Shadow” of Visible Matter?